Wonderful show at the winery in Woodinville Washington tonight. Had a great seat, five rows from the front and dead center stage. The only problem was I was on the aisle and was constantly having people walk by to go and buy more wine…as usual, folks could not manage their wine tonight. There were so many people who are going to wake up in the morning (I do pray they all get home OK) and wonder if they had a good time… I am sure they will invent their night in their minds to fill in for the the real memories that the alcohol made them forget. Quite sad really, as Joe Walsh put on such a great show. 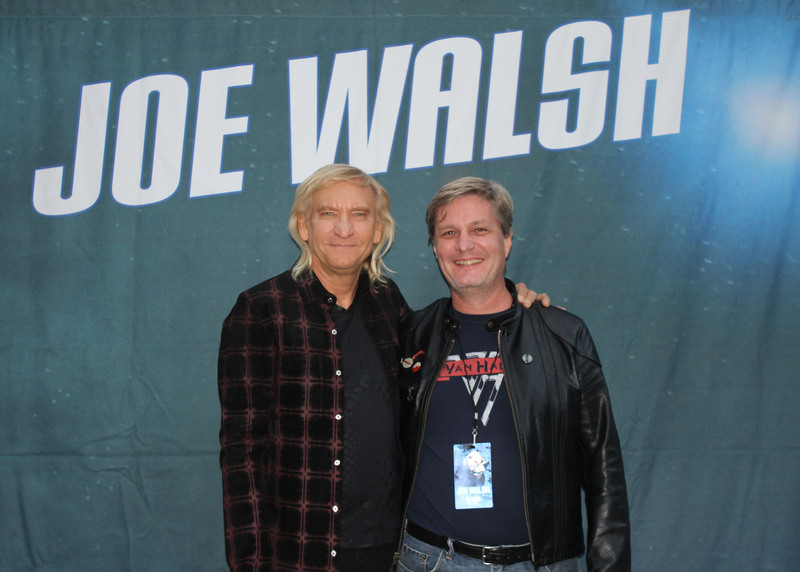 Before the show, I was able to meet Joe Walsh. I thanked him for his music, he thanked me for being a fan…we shook hand for an almost uncomfortable amount of time, we got our picture taken and then I went on my way.. He is really a very personable and gracious guy. He made sure he gave as much time to all the folks there to meet him as the wanted, and was very attentive and genuinely caring for his biggest fans. There was no opening act tonight, which was strange, but nice. When I saw him a few months ago down in San Fransisco, Bad Company opened, which was pretty cool, but having just Joe was pretty cool too. He opened up the show with Walk Away followed by Analog Man. He ended his set with an amazing set of his most popular songs, In the City, Funk #49, Life’s Been Good and Life in the Fast Lane. It was real cool during Funk #49, there was a girl in the other aisle seat next to me, who was have a great time through the whole show dancing. They came up to her a few minutes before the song and they left…the next thing I saw was her dancing up on stage with Joe Walsh and the rest of the band.. How cool was that for her! She must have been in heaven. One of my favorite songs of the the night was Take it to The Limit, where he dedicated it to Glenn Frey. You could tell by his facial expressions throughout the song, that he still feels very sad about his passing, but did a beautiful job with it. Well, as usual at concerts at the winery, I had to bail before all the drunks got behind their wheels, so unfortunately I left before the encore Rocky Mountain Way, but am glad I beat the drunks out of the parking lot and onto the road.